I ate this at Ottolenghi in London, yes I did! I had completely forgotten until reading over some old Ottolenghi posts, actually after I had cooked this dish. . Yes there are quite a few here at Toast & that was even before this IHCC Ottolenghi adventure. What can I say? I am yet to come across an Ottolenghi creation that hasn’t delighted me. He makes me want to cook & create. This dish is one of those. It was the picture that first drew me in, the spice burnished orange butternut squash & the flecks of coriander & the slices of fresh chilli. It was the perfect way to allow my jalapenos from the Hawke’s Bay to shine in all their, fruity, spicy glory. Then reading on there was cardamom, lots of cardamom, all spice, limes & a tahini yoghurt dressing. I do love cardamom, those little green, thick papery like pods hiding their dark brown seeds that can impart so much flavour. I think cardamom is one those you either love or hate. It’s warm, pungent almost eucalyptus like flavour is certainly not shy. It is a clever little spice, in that is equally at home in sweet & savoury dishes. I have even made cardamom ice cream, so with this roast squash it get’s to play on both spheres. Preheat the oven to 220°C/ 425°F/gas mark 7. Top & tail the limes & stand each lime on a chopping-board & cut down the sides of the fruit, following its natural curves, to remove the skin & white pith. Quarter the limes from top to bottom & cut each quarter into thin slices. Place the limes in a small bowl, sprinkle with a little salt, drizzle with 1 tablespoon of the olive oil, stir & set aside. Next, cut the squash in half lengthways, scoop out the seeds & discard. Cut each half into 1cm (1/2 inch) thick slices. Slice off the peel, if you wish, & place the slices on a large baking-sheet lined with greaseproof paper. For the sweet spices place the cardamom pods in a mortar pound to get the seeds out of the pods. Throw away the pods & work the seeds to a rough powder. Transfer to a small bowl, add the allspice & the rest of the olive oil & stir well. Brush spiced oil over the slices of squash. Sprinkle over a little salt & place in the oven for 15 minutes or until tender. Remove from the oven and set aside to cool. For the dressing, whisk together the yogurt, tahini, lime juice, 2 tablespoons of water and a pinch of salt. The sauce should be thick but runny enough to pour. If need be just add a little more water if necessary. To serve, arrange the squash on a serving platter & drizzle over the yogurt sauce. Spoon over the lime slices & their juices & scatter the chilli slices over the top. Garnish with the coriander & serve. I love this one! I do...this would be one of my favourites...really! The sweet spiced pumpkin, sharp salty lime, fresh chilli fragrant coriander & that tart dressing all just burst in your mouth in the most glorious sweet, tart, spicy minglement* of of flavours. The taste leaps of the page reading this post. And I have all the ingredients so have added to my menu plan for the week. I love the bright colors in this dish. Really cool that you had the opportunity to eat this at Ottolenghi's! Thanks Michelle, yes it was great & top of the must eats on my last trip home :) Probably still at the top of the list the next time I am back in the mother country! This dish is so vibrant and has such a lovely presentation! I just love all the colors with the sauce drizzled here and there. I just know it is delicious!! Thanks Deb, yes you can't really beat lime & chilli right? Mairi, looks utterly gorgeous - I can't believe I haven't made this one yet. But I know that if you say it's one of the best, then it really is. With all the butternut around at the moment, I definitely have to try this. Zinged up with the lime and chilli, I can really imagine the flavour explosion. 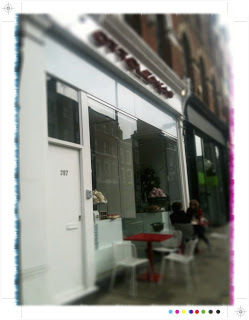 I am totally jealous though that you got to eat at Ottolenghi in London!! Thanks Sue, it was a beautiful lunch, like his recipes the restaurant exceeded all expectations! I am officially envious, Mairi! 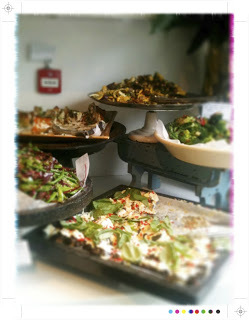 What a treat to eat at Ottolenghi. Someday! And oh my, your photo of this dish is just stunning and I really have to make it soon. Have a wonderful weekend! Hi Hannah, it was definitely a treat :) And you must make this one it is a stunner!